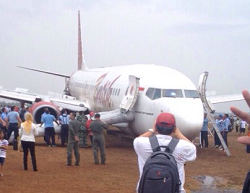 On landing in rain, the 737 overshot the end of the runway at Yogyakarta and came to rest with its nosegear collapsed. No one on board was hurt. 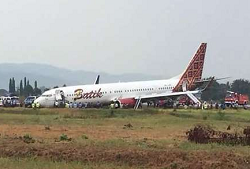 After what appeared to be an abnormally „heavy“ touchdown on runway 09, Batik Air flight ID 6380 skidded off the end of the runway. At the time of the landing local weather consisted of moderate rain. No METAR/TAF avialable for Yogyakarta Airport (WARJ). 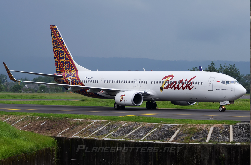 The 737 came to rest approximately 100 meters beyond the end of the runway. 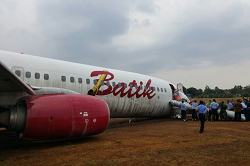 Its nosegear appeared to have collapsed during the overrun. After coming to a standstill on soft, but even ground, all on board were evacuated via onboard emergency slides. 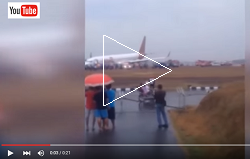 Airport traffic was halted for the aircraft removal. Runway 09/27 has an asphalt surface and is 2199 meters (7215 ft) in lengh.